Eversharp fountain pen set from the 1930s. 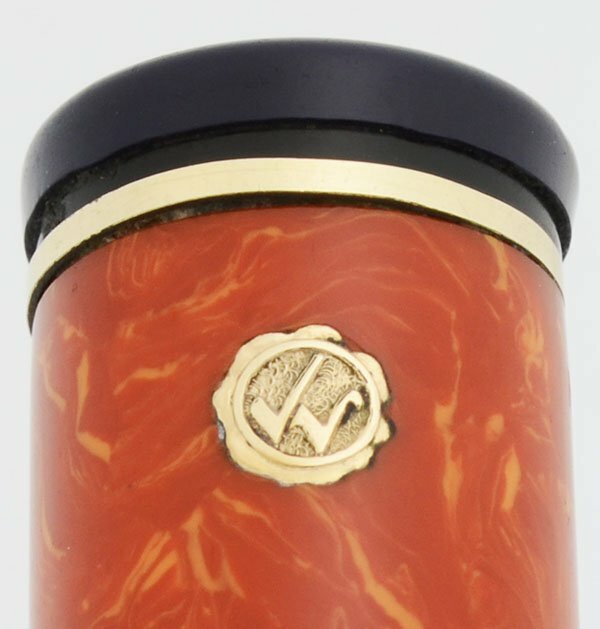 Flat top style full sized Gold Seal in Coral with gold trim. 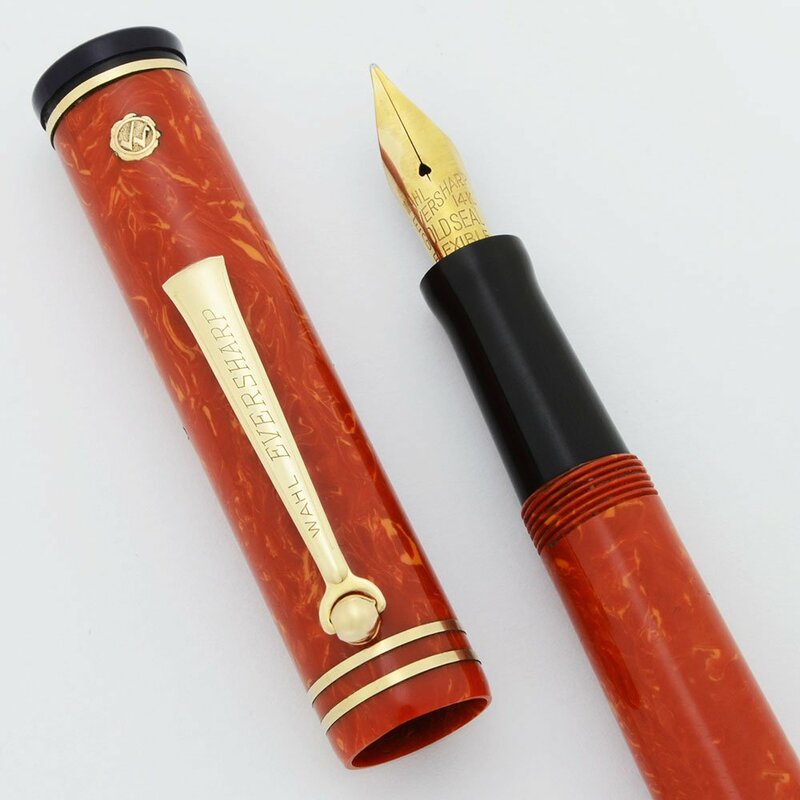 The fountain pen has a medium flexible Gold Seal nib. The pencil takes 1.1mm leads. Excellent condition. The pen is in better condition than the pencil. 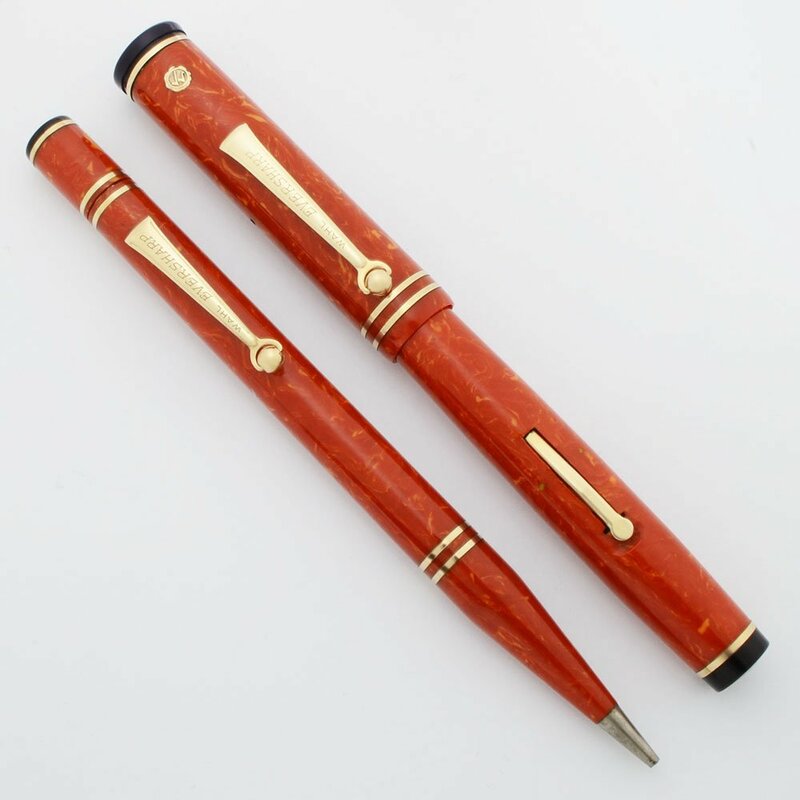 Type Vintage oversized fountain Pen. Product Name Gold Seal fountain pen set. Manufacturer and Year Wahl Eversharp, USA -- 1930s, the Wahl imprinted version is referred to as a "New $5 pen" in the 1928 catalog. Length Both pieces are 5-5/16" long. Filling System The fountain pen is a lever filler. The filling system is working well with a brand new sac. The mechanical pencil uses a twist mechanism. It extends leads but does not retract them. It takes "thick" or 1.1mm leads. Color Coral Pyroxalin cap and barrel with gold filled trim. The fountain pen has a black section and black pieces in each end of the pen. There are a total of four narrow bands on the pen. The pencil has a black cap piece and a total of 5 narrow bands. 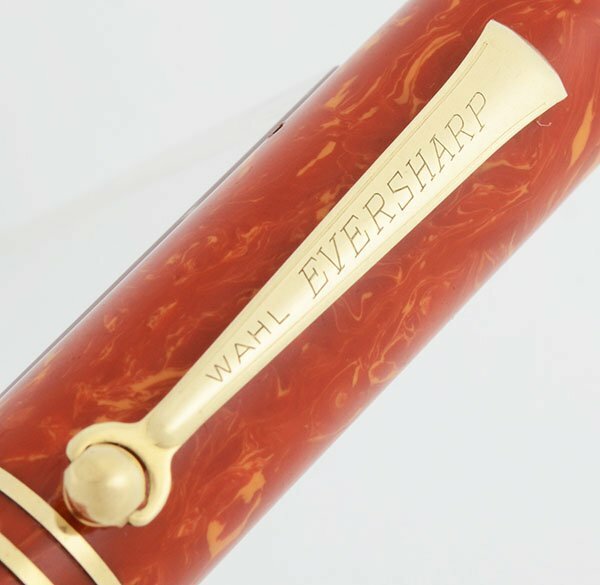 The pen, but not the pencil, has the Wahl Eversharp Gold Seal on the cap. 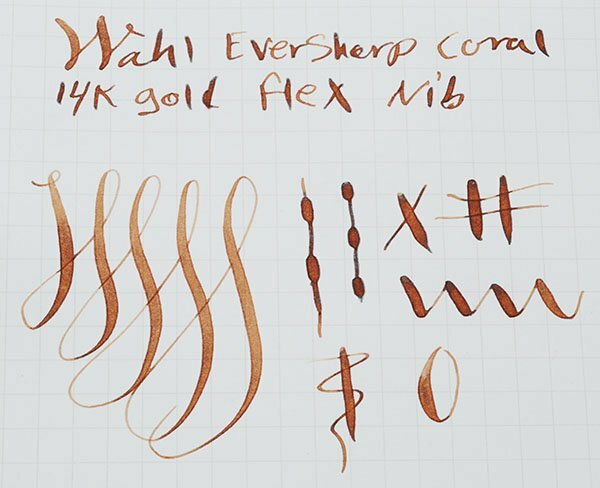 Nib MEDIUM FLEXIBLE 14k nib labeled, "Wahl Eversharp Gold Seal Flexible." The feed has an M on it for medium and the nib is wet with strong line variation. Please see the writing sample below. Condition Excellent + condition. The coral is beautiful and bright. We think the black top on the pen is a replacement from another Wahl, as it flares out slightly and seems to have a recess that requires a wider band. Also, there's a socket in the top of the cap that would have held a Wahl Eversharp Gold Seal emblem, but that is missing and instead this pen has the Gold Seal emblem above the clip. The coral directly around the narrow bands on both the pencil and the pen are slightly darker than the rest of the coral. The imprints are clear. The fountain pen has very little plating wear. The pencil cone is heavily brassed. The pencil cap also has a mark from clip contact. No cracks, chips, dents, or major scratches. Fully restored and working well.